, one of the promoters of the reformation, was born in 1534, at the castle of Chabot in the Maconais, and was descended of a noble and ancient family of the Forez. His father dying when he was very young, the care of his education devolved on his mother, who sent him to Paris, where he first was initiated in the principles of the Protestant religion. These he afterwards became better acquainted with at Thoulouse and Geneva, when introduced to Calvin and Beza. On the death of an uncle he was recalled home, and again sent to Paris, in consequence of a contest respecting the will of that uncle, who had left considerable property. 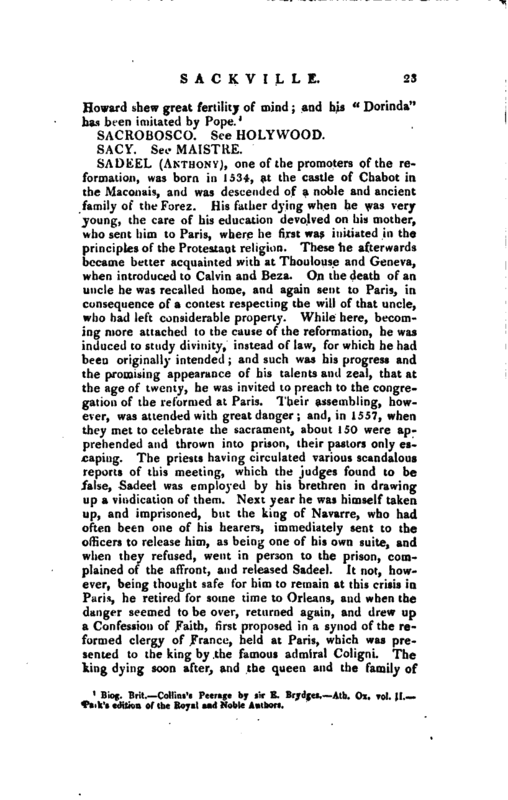 While here, becoming more attached to the cause of the reformation, he was induced to study divinity, instead of law, for which he had been originally intended; and such was his progress and the promising appearance of his talents and zeal, that at the age of twenty, he was invited to preach to the congregation of the reformed at Paris. Their assembling, however, was attended with great danger; and, in 1557, when they met to celebrate the sacrament, about 150 were apprehended and thrown into prison, their pastors only escaping. The priests having circulated various scandalous reports of this meeting, which the judges found to be false, Sadeel was employed by his brethren in drawing up a vindication of them. 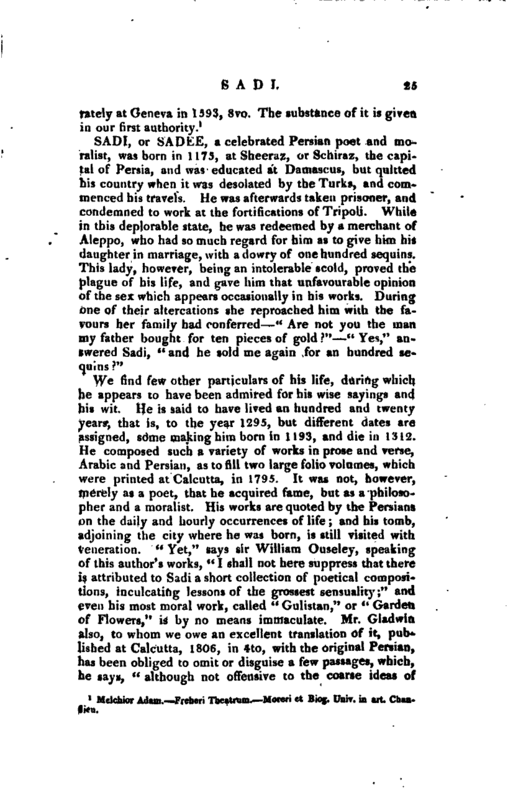 Next year he was himself taken up, and imprisoned, but the king of Navarre, who had often been one of his hearers, immediately sent to the officers to release him, as being one of his own suite, and when they refused, went in person to the prison, complained of the affront, and released Sadeel. 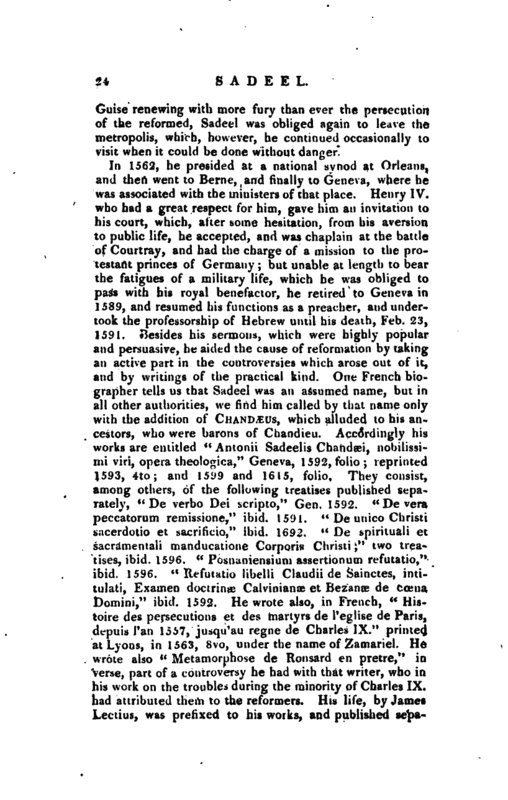 It nor, how^ ever, being thought safe for him to remain at this crisis in Paris, he retired for some time to Orleans, and when the danger seemed to be over, returned again, and drew up a Confession of Faith, first proposed in a synod of the reformed clergy of France, held at Paris, which was presented to the king by the famous admiral Coligni. The king dying soon after, and the queen and the family of | Guise renewing with more fury than ever the persecution of the reformed, Sadeel was obliged again to leave the metropolis, which, however, he continued occasionally to visit when it could be done without danger. Melchior Adam.- Freheri Theatruna. —Moreri et Biog. Univ. in art. Chandieu.